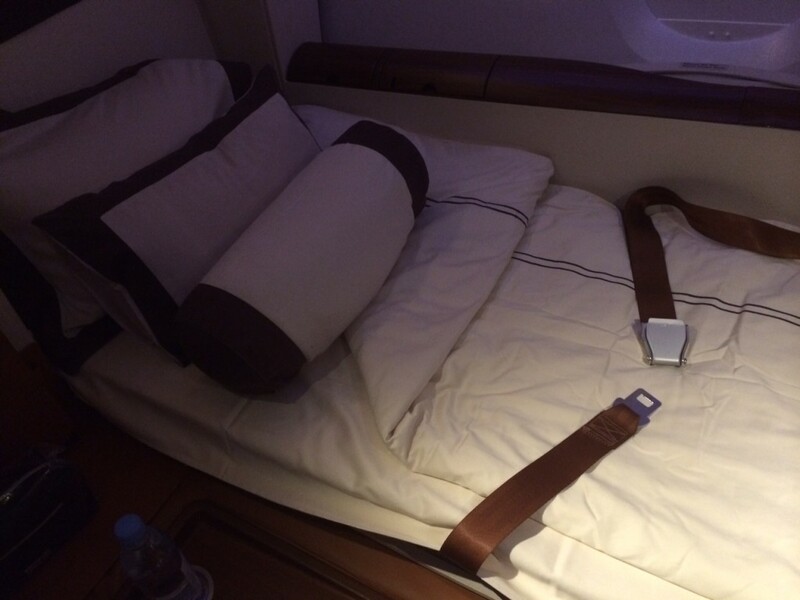 This is my review of the Singapore Airlines A380 First Class suite, flown from New York to Frankfurt. There are a few First Class products which have a reputation which sets them apart from the rest. British Airways does not often feature on such lists, unfortunately. 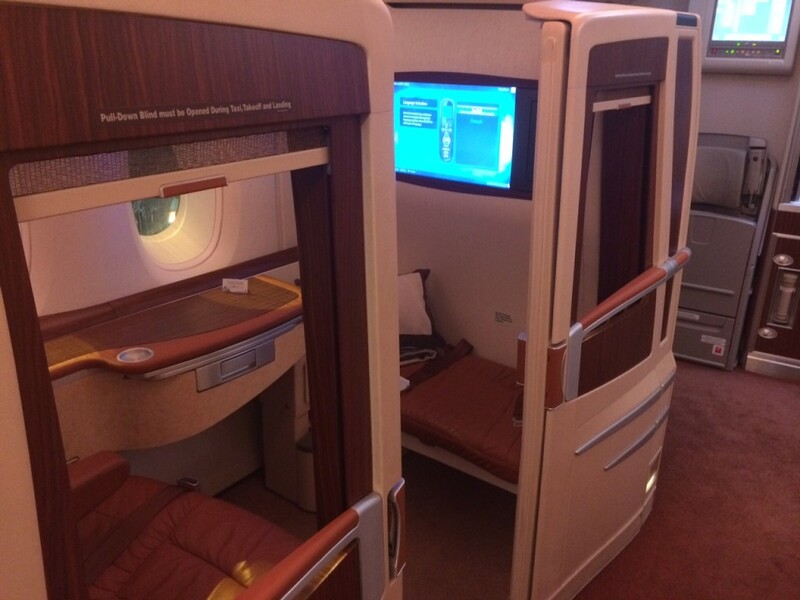 In terms of ‘hard product’ (ie seat) you have Emirates and Etihad setting the benchmark. In terms of food and drink, I have always found Lufthansa and Swiss to be excellent. One airline that is generally seen as getting both the seat and service right at the moment is Singapore Airlines. I had flown Singapore Airlines First Class once before, about six years. This was a flight from Singapore to Tokyo. It used a very old plane with (amazingly) non-fully flat seats – it was a bit like the British Airways cradle seat of the early 1990’s. The food and drink were excellent though. Singapore Airlines has raised the bar substantially since then. 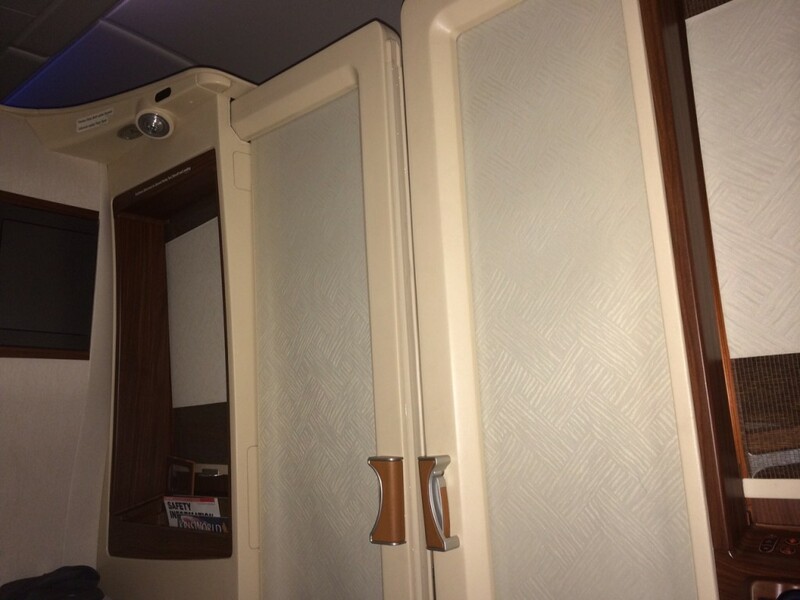 With their A380 fleet, they introduced the First Class Private Suite. 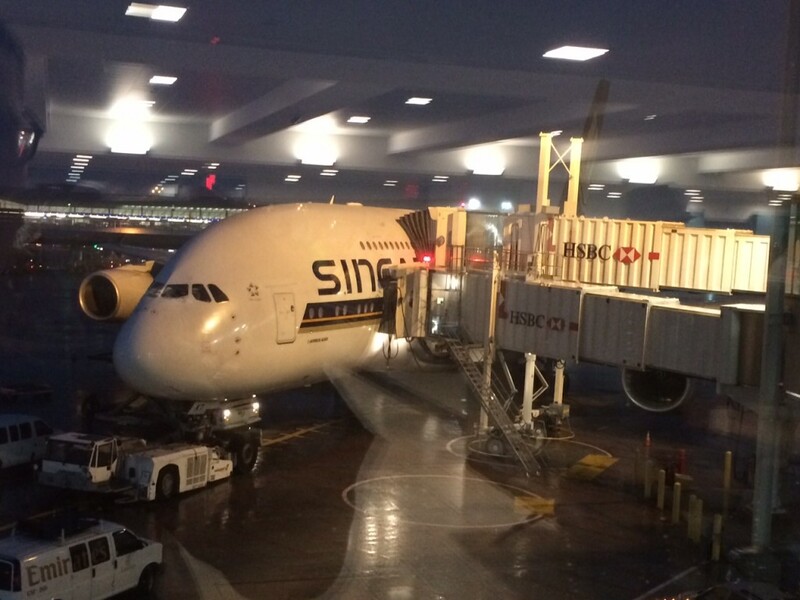 I would have preferred to fly Singapore on the outbound flight to New York but seats were not available. It was available for my return trip so I booked it, even though I was only awake for part of the flight! I am keen to try it again for a longer sector. I will look at the food and drink in a separate article later this week. Today I want to share a few photographs of the plane interior. This is how the suites look from the outside. To the left of the photograph is the staircase leading upstairs to business class. The colour scheme, to be honest, feels a bit 1980s with a lot of brown dominating. It is a l-o-n-g way away from the ‘blingy’ approach of the Emirates A380 suites. On the other hand, the Emirates suites do feel distinctly more modern. Not necessarily better, but more modern. You can see the interior layout better here. The seat is in the take-off position (apologies for the lighting but it was a night flight!). The TV is quite high when you are seated. There is not a lot of storage space inside the suite but there are two cupboards on the outside which are big enough to hang a jacket inside (which I did) or store a bag. After a couple of hours, the crew – delightful to a man (and woman) – came along and made up my bed. Annoyingly I didn’t see how they did it because I went to sit in the next suite forward which was empty. You will notice that the bed goes right up to the window, with a gap near the door for a drink, a book etc. However, the seat goes right up to the door, with the ledge / table by the window. It is NOT a simple case of the seat becoming a bed. All of the interior is reconfigured. Of course, compared to my outbound flight – where I had an entire First Class cabin on Lufthansa to myself – this suite felt positively crowded. I think there were 5-6 suites occupied out of the 12. 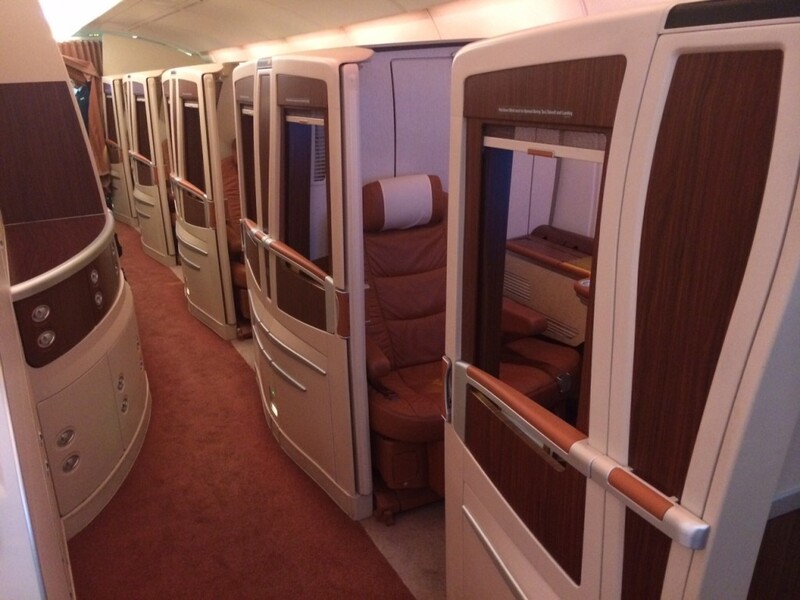 For a l-o-n-g time Singapore Airlines did not release First Class suites for redemption. They do now, but generally only for members of their own Krisflyer programme. Luckily, Krisflyer is a partner with American Express Membership Rewards. It was very straightforward to open a Krisflyer account and transfer across the required points. I would have been in trouble had the seat I wanted disappeared during the 3-4 days it took to transfer the points as I had no date flexibility, but luckily I was OK.
Krisflyer allows one-way redemptions. If you can find a day with ‘Saver’ availability, it is just 57,375 Krisflyer miles each way between New York and Frankfurt. The headline price is 67,500 but you receive a 15% discount for booking online. This is, obviously, a steal compared to 60,000 miles each way for British Airways First Class between New York and London. If there is no ‘Saver’ availability, you can pay a rather pricier 130,000 miles each way (110,500 after the 15% online discount) for a ‘Standard’ redemption. If you want effectively ‘last seat availability’ it is a crazy 460,000 miles each way! I’m not sure if Singapore now makes more than one Saver and one Standard seat available per flight. As far as taxes are concerned, Singapore does add fuel surcharges. On a one-way from New York to Frankfurt you pay $222. On a one-way in the other direction, you pay €255. Note the outbound is an 08.20 departure so you would need to spend the night in Frankfurt first. In a couple of days I will share the food and drink menu with you. What is the cabin temperature like in the suite? I often find it far too hot in BA First and that’s with a more open cabin for air to circulate. Ditto – I sleep WORSE when it’s warm, not better! Remember being on upper deck from JFK to FRA with SQ and was actually sweating due to the heat! Thankfully when requested they did turn it down to a more tolerable temperature. Haven’t noticed it to be a problem on more recent BA or SQ flights though. Ah, happy memories! The bed folds down out of the wall behind your seat. When stowed, this gives good separation / insulation between your suite and the adjacent one. Before the bed can be lowered out of the wall, the seatback is folded forwards until flat, with the surface that is normally against the wall now facing upwards. The bed partially covers the seat, but the exposed part has useful little trays cut into it, where you can store water / watch / specs and any other bits and pieces that you may need during the night. Can’t believe it’s been 5.5 years. I was only able to get it as a bmi Diamond Club redemption by booking F on the 747 in the full knowledge that the A380 was on its way. Those were the days! Why is it 57,375 a steal compared to 60,000? Especially if you actually want to get to London, rather than Frankfurt…Or was that meant to be ironic?? I think there is an allowance for quality comparison in there somewhere! 57375+ 4500 one-way from FRA = 61,875. I am assuming that most people would consider 1,875 additional Avios more than acceptable for unlimited Krug, Dom Perignon, the pile of Ferragamo toiletries they give you (inc a full 30ml EDT), the caviar, lobster etc etc …. oh, and a private suite! Flying in this later this year to NZ – Suites Class to Singapore then have to slum it in First to Auckland 😛 Amazing value compared to BA and way better availability via KrisFlyer! Really? They did a plane swap so I was actually due to be on the 777 back to London but switched to the earlier flight so I could have Suites, as I assumed it was better! 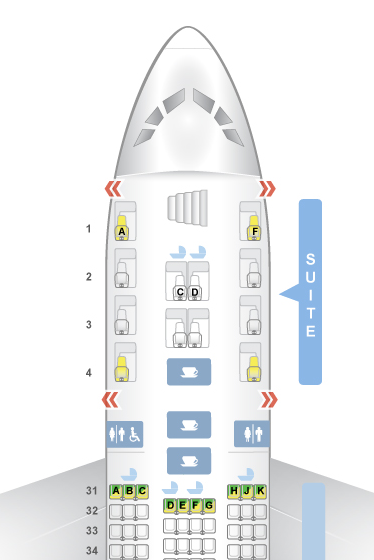 Check that it’s the new 777 (was SQ318/319) and if so might be worth giving it a try, especially if you are in suites on the way out and going in the old F. You’ll have hit all three SQ F products in one trip! I flew last October when the plane was 2 weeks old, still had that “new car” leather smell hah! Are there ever transfer bonuses from Membership Rewards to KrisFlyer? However …. you can create a 73 per cent bonus if you do a bit of work! Singapore is in the Amex International Dollar Card scheme at 1 to 1. If you get an International Currency Card ($ version) you can transfer MR points from your UK to IDC accounts. They get grossed up by the current exchange rate, so a 1 to 1.73 bonus. I have one of these and it works fine, albeit you can only transfer once a year. Card is a bit of a pain to get and may require bank refs, Green version has $100 fee plus $36 for MR membership. Platinum IDC has a 60k signup bonus as well. Do not underestimate the hassle required in getting these cards, they DO want bank references and it can take 2-3 months to be approved. Totally agree, although looking forward to making another transfer across from my UK account now a year is up – great at the current exchange rate!! GBPUSD at 1.73?? I wish! Or does the IDC actually give you a better rate than interbank? Was not in a position to look the exact number up when bashing that reply out on my phone, so guessed. In theory I have enough MR rewards for a Singapore Zone 2/3 redemption in Suites/First (which basically covers SE Asia). 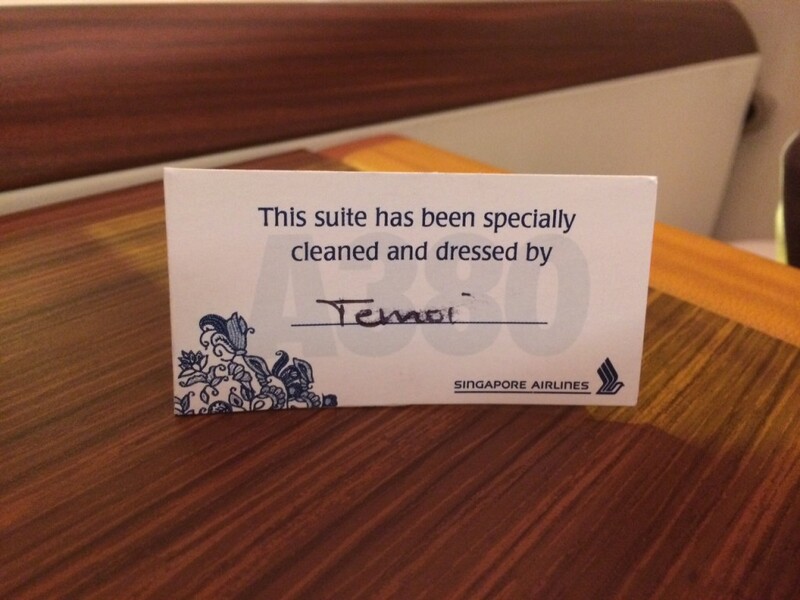 Do they operate the A380 Suites Class on any short-haul Asian routes? Would like to use my Virgin Miles on SQ but I know the plane types are quite restrictive i.e. no A380 Any Europe to Asia routes on which I could definitely use my miles? Off topic a bit from this review, but I don’t go out of the way to go on Singapore Airlines as they are overpriced. The gap between standard economy and business class is also huge; they really need to introduce premium economy. It’s either the usual cattle class hell hole, or flat beds, no in between. I’m researching a RTW trip in business class. I rejected Singapore Airline and Star Alliance with one of the reasons being that Singapore Airlines think they are so special that if you book a business class RTW on Star Alliance, then you need to pay a Singapore Airlines surcharge every time you set foot on a Singapore Airlines aircraft. This is not a fuel surcharge, it is a Singapore Airlines business class surcharge as they think their business class is so special that you need to pay extra to fly on it compared to all other Star Alliance airlines who will let you into their business class on the standard RTW business class airfare.